April showers bring flowers – and mosquitoes!!! The one good thing about our prolonged dry spell is that we have had almost no mosquitoes for months…but that is about to change. Truly, mosquitoes are some of the most pestilential insects on this earth – not only is their bite unpleasant, but some species have the capacity to transmit diseases. People will do almost anything to get rid of them. And pest control companies prey on this urge, and will sell you just about anything. Some pest control companies boast right up front that these misting systems also kill “spiders, ticks, fleas, wasps, gnats, and roaches” as well as mosquitoes. Of course, they don’t mention that along with these “undesirables,” the mist also destroys butterflies, honeybees, ladybugs, praying mantids (and some of us consider spiders to be beneficial), etc., and is toxic to fish and amphibians. In other words, although the chemicals used in these systems may be relatively safe for humans (but check out this link for some sobering information) I wouldn’t want my child or dog or cat to be directly exposed to them. Yes, pyrethroids are derived from plants, but they are generalist poisons that are bad news for many creatures. 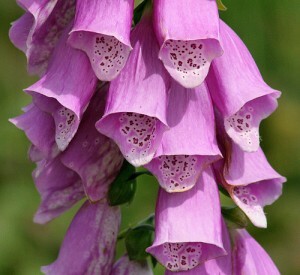 And just because something comes from a plant doesn’t mean it is safe – would you want to be sprayed with extracts of oleander, foxglove, or poison ivy??? We frequently receive calls from butterfly gardeners around town who worry when their neighbors install one of these systems that it will impact their gardening efforts. We don’t have good news for them – yes, it will. Gardening for butterflies with one of these systems next door (since the mist can drift, and flying insects don’t stay put) is like putting out bird food if you have an outdoor cat. You are luring butterflies and other beneficials to their death. The companies installing these systems will assure you that since you can use the spray just at night, day-flying insects will not be affected. But think about it: first, many beneficial insects are active at night, and many larval insects (e.g., butterfly caterpillars) are not able to fly away from areas that are sprayed. Furthermore, plants or other objects near the spray nozzles build up a residue of the poison that is certainly not good for anything eating them or living in or on them. You may be surprised to learn that scientists working on mosquito control do not like these home misting systems any better than I do. A couple of years ago, while doing research on mosquitoes and careers in entomology for the new insect wing, I talked at length to Dr. Rudy Bueno, head of the Harris County Mosquito Control Division (part of Harris County Public Health and Environmental Services, www.hcphes.org ). I was impressed (and frankly surprised) by the conservative nature of their spraying programs. For Dr. Bueno’s crew, spraying is a last resort, done in specific areas where their field workers have identified large populations of mosquitoes that may vector diseases such as West Nile virus (not all mosquitoes transmit disease), and where they cannot use other treatment methods such as getting rid of the standing water or treating with mosquito dunks. They only spray when an outbreak cannot be controlled with more benign methods, and – here’s the rub – the sprays they use contain the same chemicals as the home mosquito misting systems. Dr. Bueno’s concern is that through constant exposure to these chemicals that mosquitoes get through the home systems helps mosquitoes to evolve resistance to the chemicals – making the county’s spraying efforts much less effective, and meaning that more potent and dangerous chemicals may have to be used to control outbreaks. I asked Dr. Bueno what he would recommend to the homeowner concerned about mosquitoes. Their mantra in HCPHES is “reduce the source” – in other words, eliminate as much as possible any place around your home where mosquitoes might breed. Some mosquitoes can breed in less than a tablespoon of water, or even in wet leaves, and can complete their life cycle in less than a week. Most homeowners are fairly careless about leaving potential breeding spots on their property. 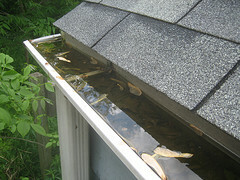 Clogged gutters, plant saucers, bird baths, dog or cat water bowls, and many other containers that hold water are all potential breeding sites. So clean out those gutters and change the water regularly in bird baths and drinking bowls, and turn wheelbarrows or pots or buckets upside down so they don’t hold water. Put mosquito fish (Gambusia affinis, a small native fish species that eats mosquito larvae) into any outdoor ponds. In areas of standing water that can’t be drained you can use “mosquito dunks” – floating “donuts” that release a bacterium (Bacillus thuringensis israelensis,) that infects only mosquitoes. One of the main places mosquitoes breed in Houston is in clogged storm sewers, so be sure not to put leaves or other debris into these sewers. Of course, if you live next to a salt marsh or other area with shallow standing water, you may still be plagued by mosquitoes from time to time. But there is a lot we as homeowners and good citizens can do to reduce the number of mosquito breeding areas right in our own neighborhoods. 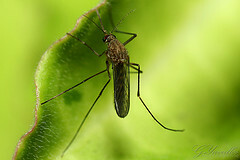 Click here for more information on mosquito prevention. In my opinion, these home misting systems should be outlawed! Yet to date they are almost completely unregulated, and people are so eager to rid their surroundings of mosquitoes that they don’t think about the consequences of the widespread use of these poisons. Please do your research, and some thinking, before you spend any money on mosquito control. One thing you can do is check out information in the lower level of the Butterfly Center – a computer kiosk rates a variety of potential mosquito control methods. You’ll learn that in addition to “reducing the source,” using repellent with 33% DEET (more is overkill) and/or wearing long-sleeved shirts and pants when outdoors in mosquito-infested areas are the best ways to prevent bites. And in your backyard, a simple fan can keep mosquitoes away during outdoor activities, and in fact is as at least as effective, and much safer, than any of the candles or coils on the market. I hope one day the Environmental Protection Agency will ban the use of home mosquito misting systems and other supposedly “benign” poisons that may make our lives more comfortable but that on closer examination have deleterious effects. It would be nice if pest control companies would voluntarily stop installing these systems, but as long as the public demands (and shells out money for) them, why should they? In the meantime, I’ll be trying to educate as many people as I can – and I hope you will too. Butterflies, honeybees, ladybugs, frogs, fish, and many other wonderful creatures would join in the chorus, if only they could!